Pictured are: Dr. Siobhán Walsh, Work placement co-ordinator and Agricultural Science Association (ASA) council member, Roisin Horan, Denise Stuart, Arvum, Dr. Michael Breen, Course Leader for BSc (Hons) in Agricultural Science. The winners of two ASA/WIT travel bursaries have been announced. 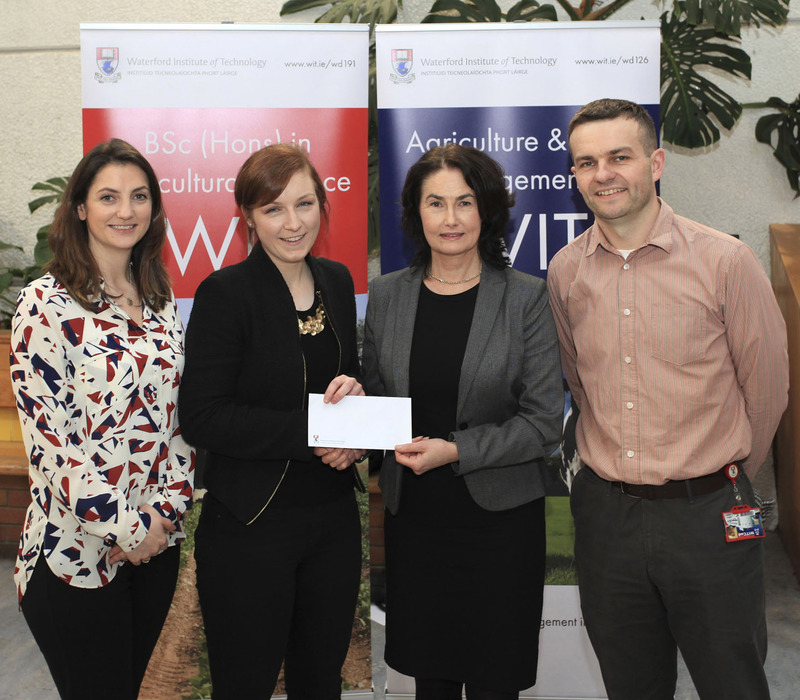 The winner of the ASA/WIT Travel bursary in association with Irish Farmers Journal and Arvum Group was third year BSc (Hons) Agricultural Science student Roisin Horan from Drangan, Thurles, Co Tipperary. The winner of the ASA/WIT Travel bursary in association with Irish Farmers Journal and Glanbia was second year BSc in Agriculture student Peter McGuinness from Boardsmill, Trim, Co. Meath. Mary Delaney, ASA President says “We are excited to be working with the Farmers Journal again this year. The experience that you gain at an international level is invaluable and will benefit these students in their future career”. Student Peter McGuinness departs on New Year's Eve to start work on 3 January with a 1,000 cow dairy herd on a farm beside the town Methven in the province of Canterbury in the South Island of New Zealand. He said: "I am very honoured to be chosen for this excellent award that was made available to my classmates and I at WIT who are travelling overseas to complete the farm placement module. It has most definitely made taking the trip to the other side of the world a lot easier! I'd like to thank Glanbia and the Irish Farmers Journal for the sponsorship of this award." The first two years of the course concentrates on equipping the student with the knowledge and skills needed to manage a modern commercial farm. The third year aims to expand the student’s business, managerial, scientific and IT skills.